The number one rule of being a writer, or even an average blog writer, is writing creatively as often as possible. Well I’m sucking at being a writer because I haven’t written here in over ten days. In my defense we took a well needed vacation and I’ve been busy walking the tight rope between getting things done and going crazy with all the monkeys on my back. Now all of a sudden Summer has flown by and I don’t know where all the time has gone. I have been spending a lot of time getting some projects underway or at least planned out. I’ve had several tradesmen out to look at various projects including a small electrical punch list (adding outlets to the porch and finally hooking up the outlet in my studio), a gentleman came out to quote sealing my studio cement floor before we put in the new storage shelves, and I got an estimate on pressure washing the decks in preparation for staining them. The pressure wash guy looked at washing the grey streaks off our gutters too but we ultimately decided to leave them because they’d just come back most likely. They only bother me and no one else cares so we won’t worry about it now. For the studio floor there are several options. The company we’re going with uses H&C products, which I think is a division of Sherwin Williams. The finish that looks the best is an “infusion reactive acid” stain, which provides a mottled look. But the process sounded to hazardous for our comfort in our home – 4 day process, have to mask doorway to the rest of the house, and there are carcinogenic materials in the finished product. Instead I decided upon a water based semi-transparent decorative stain that is zero-VOC. We selected “espresso” which will hopefully match the tile found elsewhere in the house. I just have to clear out everything from the studio so they can come in and prep, stain and seal the floor. Once sealed I should be able to spill paint on it and have it be easier to clean up with soap and water. Once the studio floor is done, we’ll start installing the new shelves and finally I’ll be organized in my studio, before I go insane. Thank you god. Speaking of organization, we got the laundry room cabinets installed and we love them. They make the room look more finished and now we have a ton of space to organize all of the laundry room essentials. I know all this costs money, and I know we should pitch 90% of what is in our home, but in the meantime it’s nice to have a place for everything. The cabinets should help with resale value as well, if and when the time comes for that. With the cabinets in, we’re waiting on laminate and then the countertop. We also need to select a sink for the laundry room and get that ordered….. So much to do not nearly enough hours in the day. If I win the lottery, the first thing I’m doing is hiring a personal assistant or two. 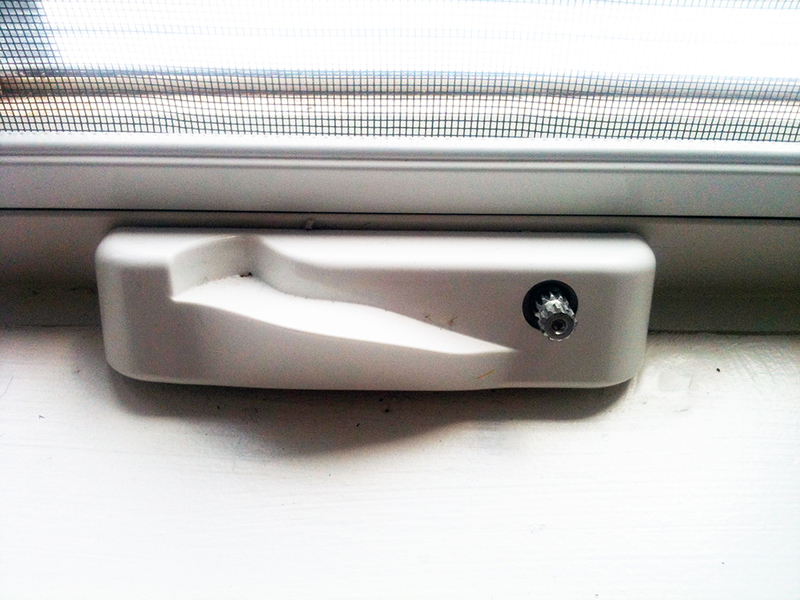 One other monkey I’m getting off my back is the window crank monkey. When they built the house three cranks went missing so I finally ordered new ones. 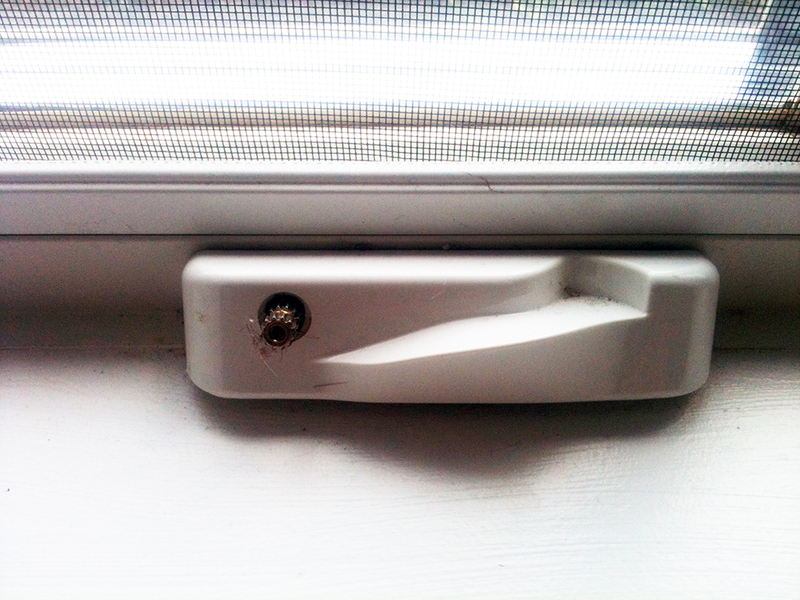 Can you believe it, the bill is $96 for three sets of window cranks….eeek. But at least that will be off my bucket list. Serious windows got bought out / went out of business so they’re under the Alpen name now. Regardless my old rep is the same. Something of interest: I had to describe which window cranks I needed to order them. Someone smart realized that they should color code the cranks so you can describe if you need a “right” or a “left”. Take a look at the photos and you’ll see that the “left” ones are silver and the “right” ones are gold. Good idea. Outside we’re slowly getting the fabric down in the front bed…still! We did plant the new, real, oak leaf hydrangea and transplanted the impostor ones. I really like the texture of these new hydrangea; they look great outside the dining room windows. Elsewhere I put together the mail order bat house and mounted it to a 16′ 4×4 post. I just have to mount the other bat house to the other side and then go erect the post with houses attached out in the yard. We’ve been harvesting a bunch of veggies, and wild blackberries in the yard and garden. And many of the wild flowers are still blooming. Everything looks beautiful. I find great pleasure in looking out my studio window as I work at the drafting board. Such a happy and pleasant view. Sorry I haven’t been writing much lately. Not sure it will be any different in the coming days. But there is a lot going on project wise, life wise and work wise. I’m wearing many hats…which is how I like it I guess. I even have an art commission and I’m working on some things writing wise beyond this blog. So it’s all good. I’m too neurotic to make any of my endeavor amount to anything but that doesn’t stop me. It’s better to burn out than it is to rust right? A silver left crank on our Serious brand window. A “gold” right crank on our Serious brand window. Assembling one of the bat houses. Laundry room cabinets are installed. I mounted the bat houses to a 4×4 post, slipping a 3/4″ strip of cedar to mount the bottom of the house to the post even with the top of the house. Oak leaf hydrangeas planted in front bed. Wild flower annuals I planted from seed this year. This entry was posted in Finish Trim, Landscaping, Living There, Moving & Decorating, Windows and tagged interior trim, landscape, windows by Chris. Bookmark the permalink.